The green and white awareness ribbon symbolizes support and remembrance for the victims of the Sandy Hook Elementary School tragedy. Blessings from our family to theirs. 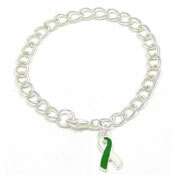 You may also order custom green and white ribbons here.